Celebrate gift giving and the spirit of Christmas with 12 Days, a lovingly illustrated card game by renowned artist Echo Chernik. 12 Days is an experience the whole family can enjoy! 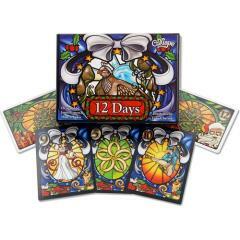 Inspired by the iconic Christmas carol "The Twelve Days of Christmas" and designed by James Ernest and Mike Selinker, 12 Days is ingrained with familiar play patterns of traditional card games; 12 Days feels like a true holiday classic. Bring joy and good cheer home to your family with 12 Days! In 12 Days, players bid for each of the 12 days of Christmas (with 1 through 12 points) with the cards from the Gift deck. The Gift deck includes all the gifts "my true love gave to me," from twelve drummers drumming to a partridge in a pear tree - plus one card each for Mr. and Mrs. Claus. In each round, players gift a card to the player on their left; play a card from their hand; try to win the round with the lowest valued card; and draw a new card to refill their hand. After twelve rounds, players score points for each Holiday card they've collected. Plus, whoever holds the most Gift cards of any one particular value scores points’ equal to the value of that card. Whoever has the most points at the end of the game wins!